Less than two months until Christmas, guys. TWO MONTHS! That’s less than 9 weeks to take care of decorating, activities, shrinking bank accounts, parties, gift giving and hopefully quality family time! Now, before we all run around screaming like our hair’s on fire, take a big breath because I’m here to help you with at least some of that! Let’s all take a look on how to pull off Budget Saving Giving with this Festive Goodie Basket! Don’t worry…recipes and printables included! Though some of my friends think I’m crazy (not denying it, but bare with me) I really like to save money during the holidays. I don’t think that breaking the bank is a smart way to spend the holidays! And really, it shouldn’t be about the money, it should be about family and friends, right? To help me not spend a fortune, I really enjoy making quality, homemade treats to give to our neighbors and friends. You may be saying ‘life’s even busier during the holidays, there’s no way I have TIME to make delicious treats!’ I said I like to save money….but I also love saving time, and you can get BOTH! I’m going to share with you 3 recipes for tasty treats you can put together in the Festive Goodie Basket really quick, saving your piggy bank AND giving you more time for the holiday fun! First, run over to Walmart and grab the necessary ingredients…. As far as the food is concerned, it’s even a quick trip, just hit the baking aisle and then swing by the refrigerated dairy section, then you’re out in a flash! Please do pay first, though 😉 You may need to pick up a couple things for the basket, unless you can find most on-hand! Crush the cookies in a zip-lock bag. The more ‘smooshed’ the better! Here’s Wonder Woman helping me out with the holiday goodies! Mix the cookie crumbs with the softened cream cheese until it’s well-combined. Roll into 1″ balls and place on a sprayed baking sheet. If you want them on pop-sticks like I have mine, insert those now. Refrigerate about an hour. Melt the Baker’s chocolate according to directions, then carefully dip each truffle ball so it’s covered. Once done, refrigerate the truffles at least an hour for the chocolate to harden. 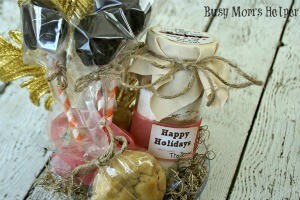 I’m so in love with jar gifts, and they’re super easy to make! You can really get creative with them, too! These cookies are delicious once baked, with the directions clearly listed on one of the adorable free printables! Free Printable Jar Label – be sure to add your signature/family name! Because jar sizes can be different, start with HALF this recipe to make sure everything will fit. Mix the sugar, baking soda & powder, flour and salt. Carefully pour into jar. Add the cocoa powder, then top with a layer of chocolate chips. If that leaves enough room for more, then do the same again! Put the lid on tightly. Wrap a piece of twine/ribbon around the jar and secure with tape. Tape the label printable in the center. Place the cloth over the lid and secure in place with twine or ribbon. Tape or glue the lid topper onto the top, so they know how to bake their yummy cookies! My favorite part of this gift are the next recipe….super addictive Caramel Marshmallow Cookies! Melt the caramels according to directions, then dip the marshmallows in so they’re covered. Place in freezer until needed. Preheat oven to 350 Degrees F. Spray or line two cookies sheets, set aside. Cream the butter, sugar, eggs and vanilla until mixed. Stir in the baking soda, baking powder and corn starch. Slowly mix in the flour until everything’s well-combined. The cookies are large, but that works nicely for the gift basket. Roll a large piece of dough into a ball, then flatten well. Place one caramel-covered marshmallow inside, then wrap the dough so it’s covered. Make sure it’s covered well by the dough, or it will melt through…still tastes great, but doesn’t look as nice. Bake for 12-18 minutes, or until dough is slightly browned and mostly cooked. Do not overcook, since the softness is one of the great things about this cookie! Now it’s time to take your fabulous goodies to make your Festive Goodie Baskets, so you can hand them out to your friends, neighbors, even party guests…saving you both time AND money! Since you’re taking these to people, I recommend putting the truffles and made cookies in packaging or wrap, securing it with matching twine or ribbon. Looks pretty, stays clean and safe to eat! Wrap a little ribbon around the base of the truffle sticks to make it pretty. Place in the cookies, your accent piece and VIOLA! You’re done with a beautiful, delicious AND budget-friendly gift ready to take! Notice my basket is color/style schemed more towards fall the Christmas? I’ve learned that another great way to save time and money during the holidays….plan and give EARLY! I give these all out during early November, which means that during the actual holidays I can really focus on what matters most: my family! Also, people get plenty later during the season, so give them a little something extra early on so it puts their season off to a wonderful start! If you need more inspiration, check out the Cooking Up Good website. They have recipes, sweepstakes, loyalty programs, coupons and more! What’s not to love? If you’re looking for a new dinner idea or a chance to win some awesome prizes, be sure to check it out! *This post is sponsored by Fleischmann’s Yeast. See my Disclosure Policy for more information. My history with pizza and family time goes WAY back, to the years I spent growing up in a pizza place. So when I got the chance to try Fleischmann’s quick-rising yeast in a delicious pizza crust recipe, I was definitely all for it! 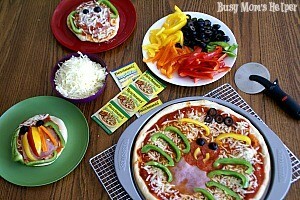 To make it a full-on activity, we had some major Family Fun with Creepy Mini Pizzas! Now, when I say grew up in a pizza place, I don’t mean going and eating there often…my parents owned Pony Express Pizza in northern Utah up until I was about 11 years old, so I spent much of my childhood there. I remember rolling out the huge cans of olives to my parents so they can open them. I was super ‘helpful’! I also remember the HUGE dough mixer where every day they’d make ginormous batches of pizza dough. It was so neat, and I really loved the smell of the yeast. Call me crazy, but I loved it! Having this deep love for good pizza, we love making them at our own home all the time. My kids know that at least once a month we’ll be having a family pizza night, and they love getting to help choose the types! Pizzas are great that way…switch up the sauces, or toppings, or even the cheese, and you’ve got something new! One problem I tend to have is planning ahead, though. Since most pizza dough requires you allow it to rise for a certain amount of time, there’s been so many occasions when I just didn’t get it ready in time, so pizza night was postponed. Not with this Fleischmann’s Fast & Easy Pizza Crust Yeast! Less than an hour to completely make the pizza dough, pre-bake it, decorate our Creepy Mini Pizzas, then cook the final creations! Now THAT’S what I call an awesome family night! Add all of the ingredients together (start with the less amount of flour) and mix until well-blended. If it’s too sticky, gradually add more flour in until it’s a nice, elastic, soft dough. Knead as needed, then divide into 8 portions. Roll each portion into a nice circle and pinch the edges to form a rim. You can fit 2 of these on a sprayed baking sheet. Don’t add any toppings yet! Bake for 6-7 minutes until set and very lightly browned on the bottom. Remove and either add toppings for immediate consumption, or put in freezer bags and freeze for up to 1 month. If using right away, add sauce, cheese, and toppings, then bake at 475 Degrees F. for about 6-8 minutes or until edges are lightly browned and cheese is melted. Cat Woman (our exchange student) helped Green Lantern with his mini pizza. Their monster-man was super fun! Wonder Woman wanted a big-eared ‘dude’ for her dinner, and the green peppers worked perfectly! Add some olive eyes for the perfect finishing touch. I think Batman’s fabulous Halloween Owl pizza was my favorite! I loved the big eyes, green pepper wings and colorful feathered belly. And the fact the my 4-year-old pulled this off without ANY help was a proud mama moment indeed! In the past it’s often happened that I just bought pre-made pizza dough because I didn’t have any extra time to spend making homemade dough. I hated the cost difference, and it just doesn’t taste the same! Now that I’ve learned how easy and quick Fleischmann’s Yeast makes pizza night…plus how delicious it turns out…I can serve up homemade pizza in a flash! For additional information, recipes and tips and tricks, visit the Fleischmann’s Yeast resource center online. *I was provided free product for this post. All opinions are my own. See my Disclosure Policy for more information. My family loves fruit, to the point we have to ration it at times. I know fruit is healthy, but if my kids want to eat a pound of strawberries every meal, that’s a bit overkill. And we LOVE Driscoll’s berries! They’re so fresh and flavorful, just perfect! And Driscoll’s wanted to share these super fun Fruity Ghost Halloween Treats with y’all! How fun are these?! One thing I love about them is how super easy they are to whip up. Plus, the kids enjoy making them, too! 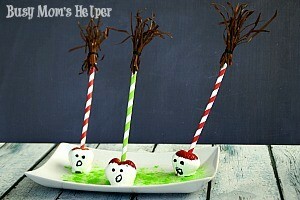 I want to get some green melting chocolate, too, to make little Frankensteins, or how about black for bats?! See, so many fun ideas with Driscoll’s Berries! Fun, delicious, and more healthy….win win! Wash your berries well, then get them COMPLETELY dry. Even a tiny bit of water can ruin the melted chocolate! Melt your chocolate as per package instructions, then smoothly dip the berries in. Place flat on plate for chocolate to harden back up. Use your writing frosting to draw a mouth (and eyes, if you can’t find the candies) then place the candy eyes on. Enjoy sharing these at your next party, or even must a fun family after-school treat! You can even put them onto a straw stacked up, to be a cute (and tasty) drink accent! Here’s a pic of the adorable ones Driscoll’s made! You know those grandma’s who are just so dang good at cooking, you always expect to be happily stuffed when visiting their home? My Grandma is that way, and always has been! 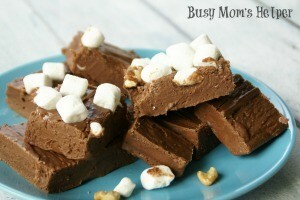 One of the many things she excels at making is this Simple & Delish Marshmallow Fudge! Toppings of Choice: marshmallows, walnuts, etc. Butter a large cookie sheet (be sure it has an edge). Set aside. In a tall pot, melt the butter over medium-high heat. Add the milk, sugar and salt and stir well. Bring to a steady boil and, stirring frequently to avoid burning, boil about 15-20 minutes. *a tip from Grandma: when stirring, don’t scrape the stuff along the top edges….it adds to the fudge somehow* To tell if it’s ready, drop about a tbsp. full of the stuff into a tiny bowl of cold water. Roll it in your fingertips, and if it makes a nice ball it’s done. If not, continue boiling. In a mixing bowl, put your chocolate chips, marshmallow cream and vanilla. Pour the hot mixture over top and mix on high until it’s all creamy. Pour into the buttered cookie sheet and allow to cool. We like to leave it overnight (covered in foil) so it sets up entirely….if we can resist eating it that long! 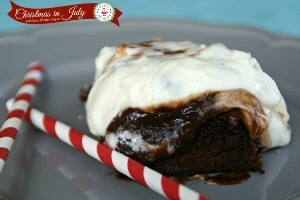 About time I posted a holiday dessert for our Christmas in July week, right?! Better late than never, I hope. These Chocolate Mint Brownies with Pudding are worth waiting for, though…so creamy, with the perfect blend of chocolate and mint flavor. Yumm-o! I got the inspiration for this from Beyond Frosting’s Chocolate Peppermint Lasagna. I mean WOW…that looks absolutely sinful! I wasn’t quite in the mood for that, but it did get me craving some chocolate plus mint. Of course, my mind went straight to Chocolate Mint Brownies (told ya, I have a brownie problem)! I’m so glad, though, because they turned out delish! Note: Make sure you make the brownies in a DEEP baking dish, so you have room for the yummy layers on top. Prepare the pudding as per the box directions, allowing to set in fridge for 10 minutes. Meanwhile, beat the cream cheese, powdered sugar, heavy cream, whipped topping and peppermint extract in a bowl until smooth and creamy. Gently stir in your Andes chips of choice. On the brownies, spread the chocolate pudding in a nice layer, followed by the cream cheese on top. Drizzle the hot fudge over the top, slice the brownies and serve. Store any extras in the refrigerator. I really love recipes that taste amazing, but are super easy to prepare. That means this is a winner in my book! Merry Christmas! Okay, so it’s the middle of July…but I’m so excited to kick off our Christmas in July fun! The next two weeks will be filled with holiday gifts, decor and other wonderful ideas! 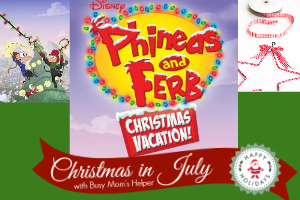 To kick it off, let’s start with our Phineas and Ferb Christmas in July! This episode is a 2-part one, and after Danville has been dubbed ‘naughty’ because of Dr. D’s machine, Phineas and Ferb must save Christmas! Fun, laughter and lots of holiday joy to be had by all! Write letters to Santa. Need some inspiration? Here’s some help! Use playdough or clay to build a snowman. Don’t forget the hat and ‘carrot’ nose! Make your own Santa hat! Get creative and draw names for a ‘Secret Santa’ exchange. Make it special and budget-friendly by making it yourself! Enjoy some fig (or other flavor) pudding as a ‘holiday’ treat! Decorate your playroom, bedroom or entire house for ‘Christmas’! Garlands, streamers, popcorn & dried fruit strung garlands, sparkly lights….have fun, make it bright! A star is definitely a part of the holidays, so here’s a fun idea to make your own! Christmastime is often filled with holiday cookies….here’s a bunch of recipes you can try out! Feel like practicing your wrapping? Go for it! Even better, DECORATE and DESIGN your own wrapping paper! Don’t miss the rest of our Christmas in July, on the blog for the next two weeks!!! While I was away at SNAP! Conference last weekend, Hubby was amazing watching over the kids. With 4 little ones, though, it’s not easy! Luckily, our sweet neighbor took Wonder Woman to and from school each day, so that was one less thing he had to stress about with all the rug-rats. 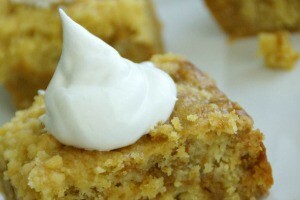 As a ‘thank you’ to our neighbor, we made a delicious treat to take over: Pumpkin Dessert Cake! If you remember a LONG time ago when I shared Hubby’s absolute favorite thing, Pumpkin Dessert, this is very similar….but with some changes. That version is much like pumpkin pie, with a very thick and creamy center. We wanted it to be a bit more cake-like, with some fun textures and flavor mixtures in it. This Pumpkin Dessert Cake does NOT disappoint…so creamy-yet-crumbly, full of flavor, and totally satisfying! Preheat oven to 350 Degrees F. Spray TWO 13×9 baking pans, set aside. Use a fork, pastry blender or potato masher to ‘smoosh’ the Butter and Cake Mixes until crumbly but mixed. Press 1/4 of the mixture onto the bottom of each baking pan (so you’ll use 1/2 the mixture). Bake for 5-10 minutes, or until barely starting to brown. Combine the remaining ingredients in a separate large bowl until smooth and creamy. Pour over the crusts. Sprinkle the remaining crumble cake mixture over the top of each pan. Bake for about 30-45 minutes, or until the middle is no longer jiggly. Allow to cool, then serve warm or cool/cold. Top with whipped topping, if desired! My kids love scrambled eggs, but refuse to eat hard boiled eggs. Why, you may ask? Honestly…I have no idea. Seriously, to me it makes absolutely no sense, but whatever. 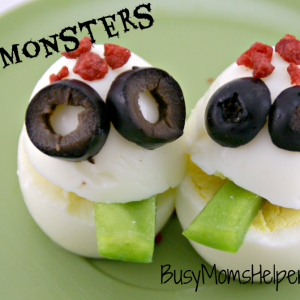 So I wanted to find a way to get them to enjoy eating hard boiled eggs (other than colored ones at Easter)….these Egg Monsters were just the ticket, and a super fun breakfast idea for Halloween! I was flipping through a book and saw all these cute food creations, and came across a frankenstein egg. So cute! I decided to make my eggs look like monsters…and the kids LOVED IT! You can really get creative with this, just using what you have around the pantry and base it on what your kids’ tastes are. You could even color them for some more unique monsters….but I’m not a huge fan of dying eggs. Add eyes: I used cut olives. Is the monster bald or hairy? Ours was hairy, with bacon bits sprinkled up top. Now you could add tons more, this was just a basic fun thing for us to quickly do for snack. AND THEY ATE IT!!! !